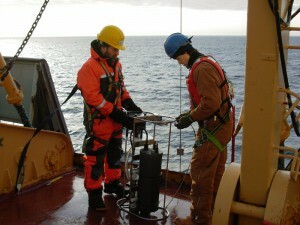 Griffith’s team sampled suspended particles of organic matter, as well as organic carbon and carbon dioxide (CO2) dissolved into the surrounding water. 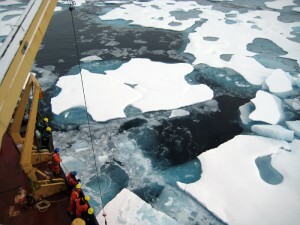 This is the first time that researchers have focused broadly on measuring multiple types of carbon at the same time and place in the Arctic Ocean—due to its remote location and the challenges of operating in sea ice, few comprehensive carbon surveys had been conducted there before this study. To analyze the contents of his samples, Griffith turned to Ann McNichol, a WHOI senior researcher and staff chemist. At WHOI’s National Ocean Sciences Accelerator Mass Spectrometer Facility (NOSAMS), she tallied the total number of carbon atoms in each specimen, including carbon-13, a stable isotope of the element. McNichol says that it can be used to determine where a particular pool of carbon originated, and how it may have been utilized by the marine ecosystem. of carbon-14, a radioactive isotope that can help determine the age of each sample to further determine its source. Also collaborating on the study were WHOI geochemist Li Xu, Fiona McLaughlin and Robie Macdonald of the Institute of Ocean Sciences, Fisheries and Oceans Canada, Kristina Brown of the University of British Columbia, and Timothy Eglinton of the Swiss Federal Institute of Technology. 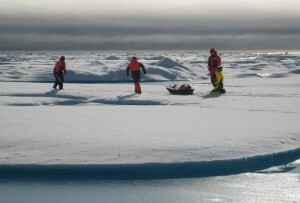 This research was funded by the WHOI Arctic Research Initiative, Fisheries and Oceans Canada, the Canadian International Polar Year Office, and the U.S. National Science Foundation. This press release was written for the Woods Hole Oceanographic Institution, June 2012.